First World Trade desired to work with some industry leaders and create a petrol based product that would dissolve 100% and leave no residue while increasing fuel economy, lowering emissions and increasing power. After years of thorough research and planning, Biomile first introduced its 1.1 gram Fuel Tablet to the Canadian and U.S. markets in September 2006, which was widely accepted. In 2007, Biomile received numerous retail and industrial application inquiries, thus creating a need to establish a distribution program. The Master Distributor program was created to support this high international demand for the product. Currently, Biomile has distribution in 20 countries and is growing rapidly. Examples of consumers include federal governments, logistics and transportation companies, public transit and more. Vehicles of all types including buses, boats, motorcycles, tractors, generators, power and heavy equipment are receiving treatments. Today, Biomile sales and its number of distribution bases are continuously increasing. Maintains valve seal integrity as well as lead. Reverses existing recession within 5,000 miles. 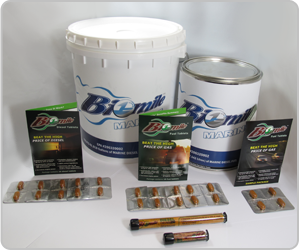 LABORATORY AND FIELD-TESTED, EPA REGISTERED - BIOMILE IS THE SAFEST, MOST ECONOMICAL AND EFFECTIVE FUEL ADDITIVE AVAILABLE.